I’m not too crazy about western movies, but I don’t hate them and I’ll watch them over a horror flick any day. Or most days. Plus I’m really starting to admire the talented and versatile actor that is Jeff Bridges. But if this hadn’t been nominated for an Oscar, and Oscar night literally being a week from today, I wouldn’t have watched the film so soon. In fact, out of the 10 best nominees, I’ve seen 6. More on that in another post. 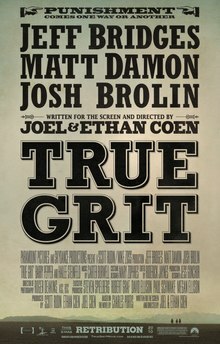 First point I want to make is this: True Grit is first a novel. Everyone is quick to call this 2010 film a remake of a 1969 John Wayne classic, which isn’t exactly correct. It’s sorta like Willy Wonka and the Chocolate Facotry vs. Charlie and the Chocolate Factory. The latter is closer to the book, so they say. Such is the case with the Coen Brothers’ True Grit. Does that make this version superior to the older one? I can’t say yet. But I am interested in seeing it sooner or later. I already know one difference which I can’t say without spoiling. I admire the Coens, but I don’t want to call myself a huge fan. People say you can spot one of their films by their style, but I’m not sure I know what that is. Maybe it’s the dialogue? If that’s the case, then that’s one thing I certainly enjoyed. With that said, if you haven’t seen the film yet and plan to: pay attention to how all the characters speak. Maybe it was a sign of the times or perhaps it was intentional writing, but I loved that they didn’t use contractions. In fact, I think I would find it difficult to go a whole day without using a single contraction. It gave the film a bit of humor when the characters spoke or said certain things. There was also a few lines that were just genuinely amusing, most notably from Jeff Bridges. "But why is the whiskey gone?" And while watching Jeff do his thing, I related him to Johnny Depp’s Jack Sparrow: an anti-hero that loves his liquor. He also shares the love of getting paid and has a strong sense of adventure. But, this is an adult drama not a family adventure so don’t expect a lot of fun to happen. By that I mean the film, at times, was a little slow. I wasn’t bored but there were moments my eyes wandered off the screen, like to my watch. But these moments didn’t last long. In fact, when people are speaking at great length, it’s best to pay attention. There are a few “shoot ’em up” scenes, but not enough to qualify as an action movie. Matt Damon did very well too. I often forgot Matt Damon was playing his Texan character, a good sign of a good actor, right? Or maybe because of all the facial hair and big hat? I was impressed regardless. He’s another actor whose work I admire. Overall, this movie was good. Good enough to own? Only if you really love westerns or you have a Coen Brothers collection or love everything Jeff Bridges. This isn’t a movie I’d pick out to watch over and over, but I wouldn’t mind watching it again. It also reminds me that if a 14 year old girl can man up, I better not complain about a paper cut. I CAN SAY WITH NO RESERVATION…KEEP UP THE GOOD WORK, my friend!!! -The entire ensemble was great (COENS are very good with casting and acting coaching) but Matt Damon was amazing, in this…the reason? Watch how subtle he is in showing that this tough, arrogant character can get his feelings hurt…I mean there were some scenes with Hailee and Jeff teaming up, where you almost feel really bad for him, it was like he was choking back tears and wounded ego, with sarcasm and bravado. -Hailee beat out 10,000 other (or more) auditiontioners for the part of MATTIE. Proof again that a properly conducted casting call is always the best way to find true hidden talent. She nailed this role to the wall!!! (Another example of casting call awesomeness, would be the super mega great actor RYAN GOSLING who was casting called for THE BELIEVER, his first big break.) It might also to be interesting to note, that the COENS allowed the actresses who tried out for MATTIE to post their audition footage online…MR. WATSON, I seriously suggest you check out the hundreds of online YOUTUBE tapes to see just how wrong other young female actress interpreted this role. Is is pretty interesting stuff to watch! -JEFF BRIDGES in JOHNNY DEPP MODE (NICE! ), he is so good in this though, it is almost like he is on auto pilot. One of my favorite movie lines of the year, when at the trial he says “Yeah, I always tend to go backwards…when I am backing up”. I don’t think I spoke on Matt Damon enough, but he really did a great job and I agree with what you said. But overall for me, what I appreciated the most was the dialogue. It wasn’t an easy movie to sit through due to the actual pace of the film but once I got comfortable, I was able to get through the rest. There were little nuggets like Jeff Bridges’ silliness to keep me interested.